Often when I post a song, I look around for public domain art that might match the message. 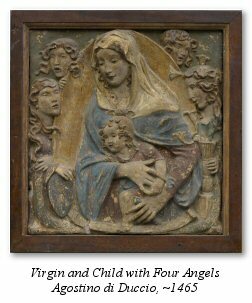 This is especially fun when the subject is Christmas, since over the centuries so much art has been dedicated to the birth of the Savior. Finding art that suits my taste isn’t always easy, however. In so many depictions of the nativity, Mary seems to have given birth to a two-year-old, and wrapped Him in nothing at all. Poor, shivering child! I tried to find art for this year’s Christmas Card Carol video, but nothing was quite right. So the video is sparse (rather like some of the swaddling clothes in the paintings) and consists of just lyrics on a background. Still, if you prefer to listen via YouTube, it’s there. This little song is lyrically very simple, and retells only a part of that beautiful story. For now it’s just solo voice. I’ll eventually get around to writing down the obbligato, and maybe next year all the “Gloria!” passages will prompt an SATB. This is so beautiful, and I can’t thank you enough for making your music so easily accessible. Bless you! I’m singing this tomorrow in Relief Society 👍. I love your music! Thank you so much for the joy you freely share with us, your fans. 🙂 I look forward to seeing the SATB of this song! Thank you so much for your site. I enjoy all the music, and I am so grateful that you have so many accompaniment tracks to use. Thank you ! This is absolutely beautiful! I love it. Thank you for sharing this lovely, tender Christmas Carol Card. PLEASE PLEASE PLEASE do this as a SATB number! It is so beautiful. In fact, all of your music is amazing! Thanks for sharing your talent for all of us to enjoy. Your music touches my heart. I always look forward to listening to your new songs. Thank you for sharing! Sally, just returned from St. George, Utah, where we had a nice family party and Christmas program for my Mom and Dad and a few of their friends, featuring a couple of our favorite ‘Sally Songs’. I probably started writing and recording music about the same time as you and Kurt did (he played trumpet on our first album…and no, I didn’t say CD! ), but I don’t think I’ve ever written anything as good as To Those Who Came Before Me, or If the Savior Stood Beside Me…you have a beautiful gift, and you’ve magnified it by your willingness to share your songs with the world. Over the past couple of years, I’ve been blessed to lead the singing in our Sr. Primary, and I’m always touched when my kids sing one of your songs–they always bring the spirit, and they usually make it hard for me to read the music through my tears (actually, that’s true both of your songs AND the kids!). What you’ve been inspired and blessed to create touches hearts all over the world…thank you so much!